O-rings O-Ring is a kind of sealing products which is usually made of springing material and through the molding way to make it in the ring ship. It is generally used to seal the fluid liquid or gas, often works as a part of the whole set of sealing parts. O-Ring is good at both in static seal and dynamic seal, main material contains: NBR O-Ring,SR,Viton O-Ring,Silicon O-Ring,HNBR,PU etc. 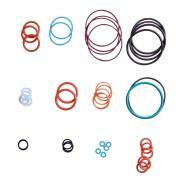 Your OEM order of oil seal or O-Ring , rubber gasket is welcomed as well. Apply for: Auto, air condition, machinery, water pumps, valves, furniture, toys, pipes. We promise the high quality but low price of Oil seal, O-Ring , Rubber seals, rubber gasket, Rubber ring, Sealing ring, Sealing gasket.